Get Connected - from Galaxy Digital - is a cloud-based, mobile-friendly volunteer management solution for volunteer centers, community groups, and other nonprofit organizations in the U.S.
Get Connected volunteer management software has been designed to help organizations of all types to better manage, grow, and track the contribution of their volunteers. Via a dashboard that can be customized to match organizational branding, users can manage a community events calendar, promote volunteer opportunities, and reach out on social media channels. Get Connected builds a database of volunteers and provides coordinators with the tools with which to communicate and engage with them. Auto-matching features automatically match registered volunteers with volunteering opportunities that align with their interests, helping to increase volunteer uptake on events. In addition to Get Connected, Galaxy Digital offer Community Connect, Campus Connect, and Corporate Connect, which are used by nonprofits, Volunteer Centers, Campuses, and Corporations across the U.S. These additional modules extend the functionality of Get Connected to include event creation and management, disaster response, and service learning. The software also facilitates collaboration with other nonprofit, volunteer, and community groups to affect change at the local level. Since launching the platform, we are experiencing an even greater interest in volunteering. Ease of use, better coordination of volunteers, increased marketing and awareness. The software is easy to use, looks great online and offers rather robust back-end features for our partner agencies and as the site manager. It's also very user friendly for both agencies and volunteer team managers. We are very excited about the growth we've seen and the positive feedback we've received by our agencies and volunteer users. The software is easy to use, looks great online and offers rather robust back-end features for our partner agencies and as the site manager. It's also very user friendly for both agencies and volunteer team managers. We are very excited about the growth we've seen and the positive feedback we've received by our agencies and volunteer users. There is nothing that we like least about the software! It's so useful to organizing volunteers and helping us streamline many processes. We still have the issue in our community that we have more volunteers than needs available or posted on the platform. While we have created a custom form on the site for a group of volunteers to request a volunteer need (specifically for teams of 5 or more people), we could use a few more features to help manage these company-based groups and to be able to streamline the process between the group's request, submission of project/needs from agencies specifically for a group, and actually matching the group to a need. We have also had more companies ask about collecting t-shirt sizes or other data from their employees upon sign-up, and I'm still working on a few work-around ideas for this. To address this process, we are currently utilizing a combination of the private volunteer need setting, user groups and initiatives. We may also start setting up custom pages on the site to organize a company's series of private volunteer needs into one centralized page that doesn't initially require a login by the user to view the need. It's all about the Customer Service... Add a great product and room to grow= A+++ rating! When West Virginia University decided to upgrade our volunteer management software, there was a lot of time and research put into the process. We have many "moving parts" to our needs, including integration with university data, single-sign-on, special reporting, large day of service coordination, and academic service-learning. No only did Get Connected turn out to be the best fit after our initial examination of the options, but WVU is very happy with our choice--mostly because of how much we admire and appreciate the caring, dedicated, smart, and cooperative staff at Galaxy Digital! Anyone who does work in the community knows that customer service is KEY. Galaxy has figured this part of their business model out to the fullest. 24/7 support online coupled with quick and effective communications via phone/email really has been instrumental in successfully launching our system. WVU is a large client for Get Connected (40K+ users with 7,500 hours tracked in our first 6 weeks) and the company has just been wonderful to collaborate with in the process. Open to system enhancements every 8 weeks or so, Get Connected has ALREADY implemented WVU's suggestions for system improvements, and has been a great partner to discuss future development opportunities. The software is a great match for our needs, and more importantly will be able to grow with the needs of our students and community. All users, including our students, faculty, staff, and community partners have loved the change and especially appreciate the clean navigation in Get Connected as well as the mobile functionality. Whether you're a small organization or a large land-grant institution of higher education, Get Connected is worth exploring if you need volunteer management software. We're happy to be part of the Galaxy Digital family, and hope those folks know that they're now part of our Mountaineer Family! Wow -thank you so much for your kind words, Alexis! We are proud to be honorary members of the Mountaineer Family and look forward to continue to support you and WVU students on all your community engagement efforts! I find the software easy to use from the administrator viewpoint and easy for the public, as well. The customer support is excellent! They have been very responsive, in a timely fashion, and always willing to help with whatever issue I might have.It's easy to use and most of the public can use it relatively easily. It's easy to use and most of the public can use it relatively easily. Would like more reporting functions (more detailed). Although I can get all the info on an excel spread sheet, since we've had this system since Aug. 2013 and there are 5,000+ users in the system, that's a lot of info to have to filter through to get what I need. Get Connected is hands down AWESOME! The software is user friendly, looks amazing on any device, and is incredibly versatile whether you are a macro level organization coordinating your catchment area's volunteer center, a single nonprofit looking to ramp up their volunteer engagement, or an individual searching for volunteer opportunities. Additionally, the support team is one of the best I've ever worked with. Huge props to the crew at Galaxy Digital for working with us whenever we need assistance or help brainstorming! There's really nothing to complain about in terms of the software - we made a giant leap forward when we decided to move to Get Connected/Galaxy Digital and couldn't be happier! I have used this product for 6 years and have always been very happy with it. It allows our community to have a portal for volunteering.Easy to use and allows people from different skill levels to navigate it easily. 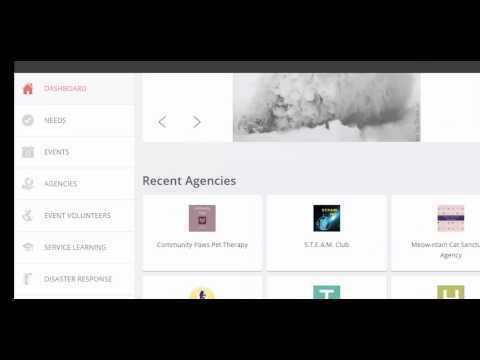 It is a great portal for volunteers and agencies. Easy to use and allows people from different skill levels to navigate it easily. It is a great portal for volunteers and agencies. Sometimes I have to remember the steps to accomplish a task that I do not do frequently. I have to go to the help screen and figure out what it is called to search. Contact Galaxy Digital for pricing information and a quote. Understand the impact that volunteerism is having within your community thanks to Get Connected's volunteer data reports, which display color-coded Annual Impact Charts, donut graphs, and bar graphs in the Manager Panel Dashboard. Allow community members to browse existing volunteer positions before registering to be matched with positions that align with their interests and passions. Accept donations via the Get Connected platform thanks to the software's integration with Stripe. Passive requests ("Donate" buttons) and active requests (invitations to donate) encourage volunteers and website visitors to donate. Set volunteerism and community impact goals and share progress and volunteer information graphically on Volunteer Impact Pages (VIPs). Extend the functionality of Get Connected to include event management, disaster response, and service learning, with a selection of advanced modules and add-ons. Below are some frequently asked questions for Get Connected. Q. What type of pricing plans does Get Connected offer? Q. Who are the typical users of Get Connected? Q. What languages does Get Connected support? Q. Does Get Connected support mobile devices? Q. Does Get Connected offer an API? No, Get Connected does not have an API available. Q. What other apps does Get Connected integrate with? Q. What level of support does Get Connected offer?